Preliminary ProceduresClean all components in cleaning solvent and air dry.The transfer case internal components are not to be serviced. 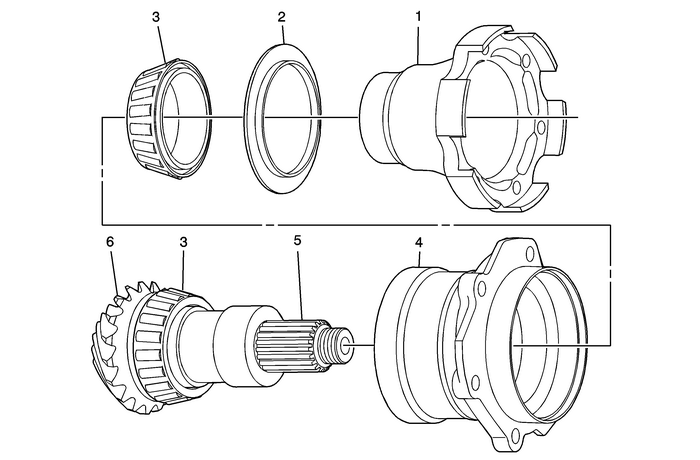 If internal componentsother than seals are damaged, the transfer case must be replaced. Replace if flange, threaded holes, or splines are damaged.Inspect sealing surface for corrosion, excessive wear, or damage. Note:Replace the slinger if damaged, cracked, loose, or distorted. Note:Inspect bearings for roughness, spalling, or pitting. Inspect for cracks, broken areas, or other damage.Inspect bearing races for roughness, brinelling, or pitting.Inspect the O-ring channel for porosity or damage.Scratches or nicks in other areas may be repaired with light sanding. Note:Inspect for damage and press fit to flange. Note:Inspect for pitting, excessive wear, or damage.